It happened the week before Thanksgiving. I was walking my trusted trail horse into his stall in our barn. One of the other horses was also being walked into his stall. Everything seemed routine. But something spooked somebody and there was a short burst of gelding energy before settling down to nibble on sweet feed. When the dust settled, there was a fifty-something woman in a heap on the stall floor. It wasn’t long before I was listening to the risks and benefits of having my fractured leg pinned vs. letting it heal on its own in a long leg cast. Aging and osteoporosis – I still find it impossible to think these words apply to me. Asking my husband to cook turkey for ten people is something most self respecting women would avoid in any way possible. But worse than the surgery, worse than the husband roasted turkey, and worse than feeling the pain of a second injury in three years was the suggestion by many around me that I quit riding. I found myself sobbing inconsolably whenever the conversation even hinted in that direction. Not the teary type, I could not get a handle of these dramatic emotions nor could I make sense of all the negative energy that seemed to be seeping into every aspect of my life. I started building an arsenal of arguments to defend myself. For example, if you were playing baseball with the grandkids and got hit in the head with a ball, would you stop playing with those “dangerous grandkids” or would you just take a bit more caution on the ball field? After spending a considerable amount of time living in a lounge chair with my hugely swollen leg throbbing, my family doting, and my horses out of my reach, it came to me ever so slowly. Normally, I would have figured everything out quickly if only I had been able to clean stalls. It is there that I solve so many problems. It is there that the cloudy becomes clear, the dark becomes light, and the complex becomes simple. It is there that I strategize, meditate, and plan. In my job, there is a lot of attention paid to “strategic planning” which means days worth of “brainstorming” and “consensus building”. I can’t help but feel that if you put that same group of people in a barn with a pitch fork and a shovel with the smells of manure and sweet grass hay mixed with the leather of the tack room and the heady smell of a few horses, life would become impressively simple and “challenges of the workplace” would melt away. Getting back to basics is a tested and true method of doing business and solving problems. But either way, the problem that was crushing my spirit causing me to weep uncontrollably and be generally miserable had little to do with the injuries or the comments of those around me suggesting I “quit this riding nonsense”. It had still less to do with the fact that something went wrong in the stall causing me to find myself in my current predicament. What it did have to do with was the fact that I was struggling to find a way to avoid resignations. That was the heart of the problem. That is what I was finally able to sort out by staring out my family room window and realizing that my gelding could feel my pain as he gazed back in my direction. If I chose to quit riding because of an injury, it would mean a huge resignation of something I love. If I were pushed into boarding my horses so I wouldn’t have to worry about the stall care, that would mean a resignation of my precious barn time. And if I chose to sell the horse that spooked in the stall, it would mean that I would be losing a very dear and trusted friend because of a single mistake that had two participants, one of which was I! Any of these resignations would have monumental consequences for me. It was one of those gut check moments. I realized I was more like my Dad than I ever thought I would be- another unmistakable sign of aging for sure. But much more importantly, it was a pearl from a man who had faced the trials of resignations and had taken a stand that he shared with me in his own simple way. I knew then that it was not about the tasks or even the individual questions that we ponder. It is the all-encompassing question of under what terms and on what time schedule will we make concessions about how we live. My dad and my mother could have resigned a long time ago and no one would have ever questioned. When he said quite loudly, “How long before you can ride again?” and the rest of the family fell silent “mid chew”, I answered, “a few weeks”. He replied quickly, “Good. I loved my horse when I was in the army. His name was Mr. Chips…” Hallelujah! Pass the stuffing!!! As of that moment, I decided to keep a tight rein on any resignations in my life. 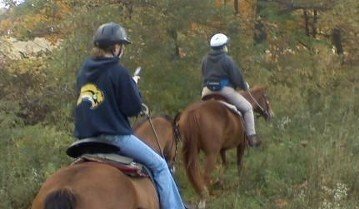 Tracey and her horse, Denver, in the lead on another trail ride. If you, like Tracey, want to keep on riding and having fun with your horse, you might like an Apprenticeship.